When a program becomes unstable, you can try to repair it, but if that fails, the only option is to uninstall it and start over. It’s important to clean up the Windows Vista Registry before reinstalling a program if you’re still encountering problems. Sometimes removing a program and reinstalling it isn’t sufficient; the program continues to cause problems in the same way it did before you went through this mind-numbing process. In some cases, pieces of the old program are left behind, even if the uninstaller tells you that it got everything. 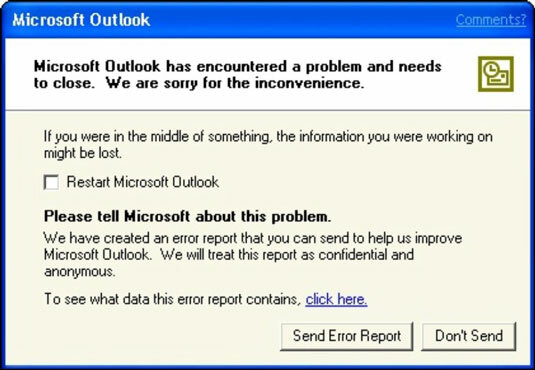 Lingering problems — which are usually in the Registry, but sometimes in a “bad” file — can keep reinstalled programs misbehaving just as badly after the makeover as before, coughing up messages like the one in the following figure. If you have problems with vestiges of old programs sticking around, choose Start, type regedit, and press Enter. 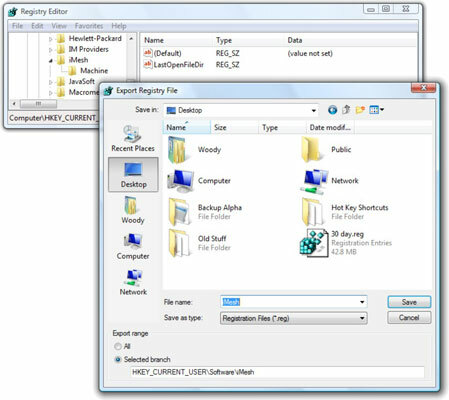 Click through a security box, and the Vista Registry Editor appears. Inside the Registry Editor, search for the name of the program by choosing Edit→Find. Searching the Registry for vestiges of iMesh. Make sure all three boxes — Keys, Values, and Data — are checked. 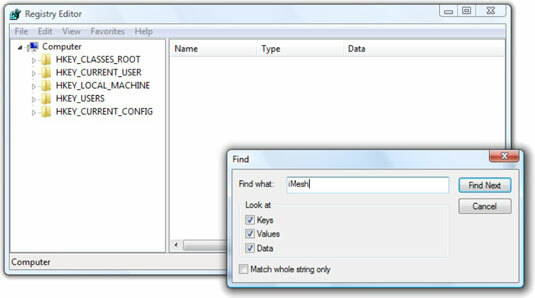 You might not be able to find the precise program name, but you may be able to find something similar to it, or possibly the manufacturer’s name. Keep searching (use the F3 key or the Find Next button) until you find a major entry for the program. Usually, you can find a major entry for the program itself, as opposed to minor entries for certain kinds of documents or filename extensions. At first, you should eliminate any major entries. If that doesn’t work, you may have to go back and pluck off the smaller entries, one at a time. If you find an entry that seems to include lots of settings for the program, right-click it and choose Export. Always export any registry entries before nuking them — just in case. When you right-click and choose Export, the Export Registry File dialog box appears. Use the Export Registry File dialog box to put the contents of this key on your desktop. Give the exported Registry key a filename that you can remember and click Save. The desktop is a good place to stick the entries because you won’t need to keep them very long. In the Registry Editor, select the offending key and press Delete. When the Registry Editor asks if you want to permanently delete the key, click Yes. Then “X” out of the Registry Editor. That removes all the old information about this specific Registry entry from your computer — and may help knock loose whatever was preventing the reinstallation from working correctly. If you skip the Exporting steps, you might find that you’ve created a monster. Taking the time to copy the Registry entries before deleting them ensures that you can undo anything that caused even greater problems to your system. And the Vista Registry is chock full of entries that can cause huge problems if they’re inadvertently deleted. Reinstall the program that’s been giving you problems. Chances are very good that going through the additional step of scouring the Registry to remove all the old, potentially bad settings makes the program work right. If the reinstalled version of the program still doesn’t work, double-click the Registry key on your desktop to put the Registry back the way you found it. That won’t fix the problem, but it does undo any changes you made to the Registry so that they don’t cause further problems. If you’re still having problems with the program, you need to contact the manufacturer to see if they have any further suggestions.